Chase the changing leaves of autumn as the colors spread across North Carolina, from Mount Mitchell to Hanging Rock to Carolina Beach. Each fall, a wave of brilliant colors starts in the North Carolina mountains, rolls across the central, urban landscapes of the state and eventually washes out at the coast. If you time it right, you can surf its entire length. Leaf-peeping season usually starts mid-September in the mountains and can last into November on the coast. In all regions of North Carolina, the first trees you’ll see turn color are usually sourwoods and black gums, but what color you’ll see is up to chance. Sweet gums may be reddish-purple or yellow while sassafras may be yellow, red, orange or even purple. Regardless of the color, your best views will come from hiking trails. You can escape the busy cities of the Triangle at William B. Umstead State Park. There are 20 miles of marked trails at this 5,500-acre park that range from short strolls to deeper explorations of the mixed forests of pine and deciduous hardwoods, such as oaks, hickories and sweet gums. Most of the deciduous trees are examples of species native to the state. That combination can lead to spectacular views of autumn colors – when you’re not busy watching the wildlife or birds. It took him a couple of trips, but Dr. Elisha Mitchell proved his point. 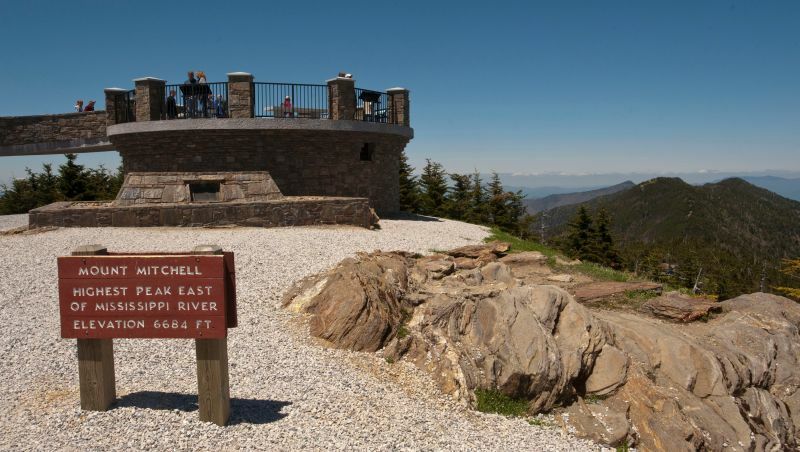 Mount Mitchell, the highest point in the eastern United States, is named after the University of North Carolina professor who calculated its towering height. 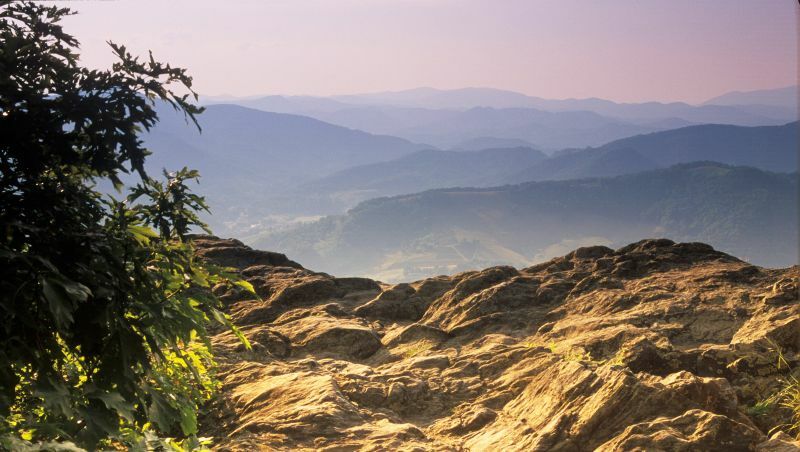 Drive your car to the summit parking area and take the trail to a stone observation platform where your view of more than 80 miles will be filled with Blue Ridge Mountains. The leaves of the red and sugar maples, staghorn sumacs and yellow poplars will stand out most. More than just a hike, the two-mile trek along the Joyce Kilmer National Recreation Trail is a journey back in time. Located in the largest tract of virgin hardwoods in the East, it inspired soldier-poet Joyce Kilmer to pen Trees. The trail features two loops, which showcase the largest trees in the forest, including tulip poplars up to 100 feet tall. If you can, try going on a weekday; it’s a popular spot on weekends. Hit the trails at Mount Jefferson State Natural Area and you’ll see different colors depending on which slope you hike. The Lost Province Trail along the southeastern-facing slope of the mountain explores an oak and chestnut forest, one of the best in the Southeast. The Summit and Rhododendron trails are more strenuous, but they offer views of the changing colors of surrounding mountains and valleys. Plan to spend an hour hiking all three. 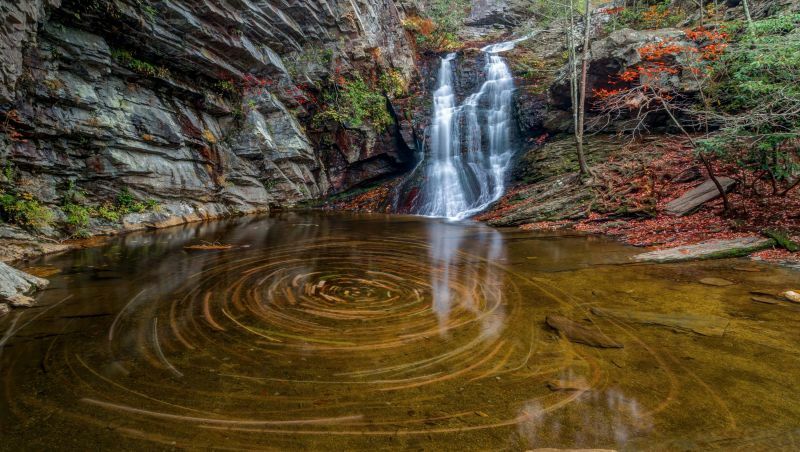 About 20 miles of trails at Hanging Rock State Park give you a chance to see the colors of the northern Piedmont. You’ll mostly see oaks, which turn a scarlet red at the end of the season. Waterfalls, cliffs and even a cave are here for you to explore, too. Lake Norman State Park’s 5-mile Lake Shore trail takes you along the shore of the state’s largest body of water and offers views of changing sweet gums, red maples, dogwoods and oaks. Their reflections in the clear water add to the beauty. The Sandhills are best known for longleaf pines. But you’ll find splashes of color on the almost five miles of trails at Weymouth Woods - Sandhills Nature Preserve. You’ll hike through hardwoods on the half-mile Gum Swamp Trail, where you can watch sweet gums, oaks and dogwoods change colors. When you’re not busy with the leaves, explore the more than 500 species of plants that grow here. The Flytrap, Swamp and Oak Toe Trails at Carolina Beach State Park, each less than a mile in length, give you a chance to see fall colors on the coast. Keep your eyes open for turkey oaks, which thrive in the sandy soils. They have the most colorful leaves of any tree at the park. The Alligator River National Wildlife Refuge, one of the last strongholds for black bears on the East Coast, offers two half-mile trails that take you through brackish water and hardwood swamps. The poison sumacs, which are found in wet areas such as these, will have the most vivid colors. But if you feel inclined to take one of its bright red-orange leaves home, be careful. Contact with the tree can give you a skin rash. 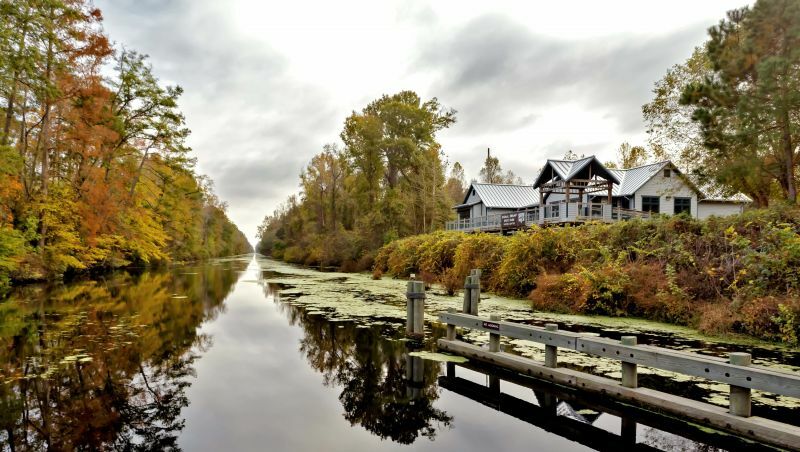 Almost 17 miles of trails built on old logging roads cut through the forests of Dismal Swamp State Park, which abuts the wildlife refuge with the same name, but you’ll have to share them with mountain bikers. Cypress, red maples, sweet gums and a variety of oaks bring color to the back drop of abundant evergreen cedars.